Custom-made hardware, custom-made software, water. Virtual Mirror - Rain is a spatial intervention which senses the rain falling outside, and then literarily mirrors it inside the building in its original form - water. Every time a raindrop falls on a rain sensor outside, the same raindrop is being synthesized and reflected back to the sky from the floor inside. The installation makes the rain “fall up” inside. In addition to the rain sensors outside, there is one rain sensor installed in the middle of the installation indoors. By dripping water drops on it, the visitors are able to interact with the installation and to activate the drops to fall up from the floor into the sky. 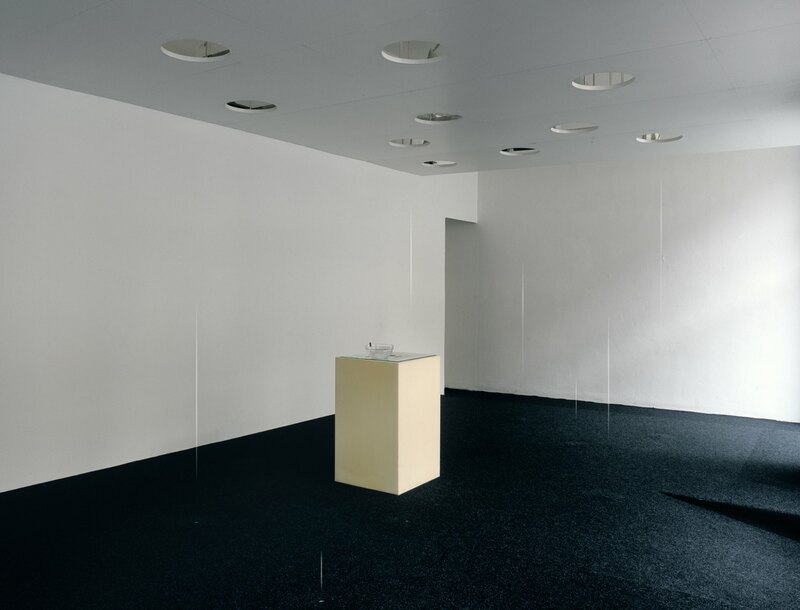 The installation Virtual Mirror  Rain is a part of a series of installations, entitled Virtual Holes and Virtual Mirrors. The series investigates the relationship between weather conditions and the built architecture in urban environment. By letting the outside weather phenomena indoors, or by mirroring them inside, Virtual Holes and Virtual Mirrors annihilate the protective function of architecture. They are undoing architecture in order to heighten our sensibility of the immediate surrounding, transforming the ephemeral and evanescent weather phenomena outside into significant and poetic events inside.